Want to know how to quickly find the musical notes of the various string instruments? The answer is “Notes Finder”! This App gives you a wide selection of 7 different musical instruments: guitar, electric bass, violin, mandolin, ukulele, banjo and balalaika. With the help of this app it is only a few minutes a day to improve your music reading Skills! Select one or more instruments and get started! 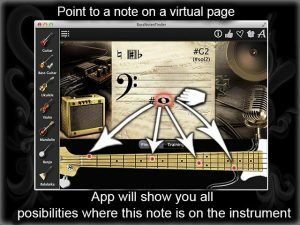 You can adjust the volume for all instruments of this App and restrict or extend the training range of the Fretboard according to your wishes. For a guitar and an electric bass, you can select preferred notation Type. Notes Finder has 2 modes: Finder and Trainer. The Finder, gives you the possibilities to find the music notes on the fingerboard very quickly. To do this, select the musical instrument and you move your Finger or mouse cursor, above or below the virtual note sheet. And you’ll see all The places on the fretboard where you can find this music note. After touching the sheet, the tone of the Note is played. You can also do other things by clicking on the fretboard and you will see the corresponding music note on the sheet. If you already know the music notes to a certain extent, then you can go to the Training. Click Start button and the Trainig will start immediately. The places on the fretboard are displayed for which you should find the right music note. Put your Knowledge to the test and measure your progress to get the best results! 3. Built-in note signs: Standard (A, B, c) as well as Solfeggio (do, RE, MI). Download “Notes Finder” App now!